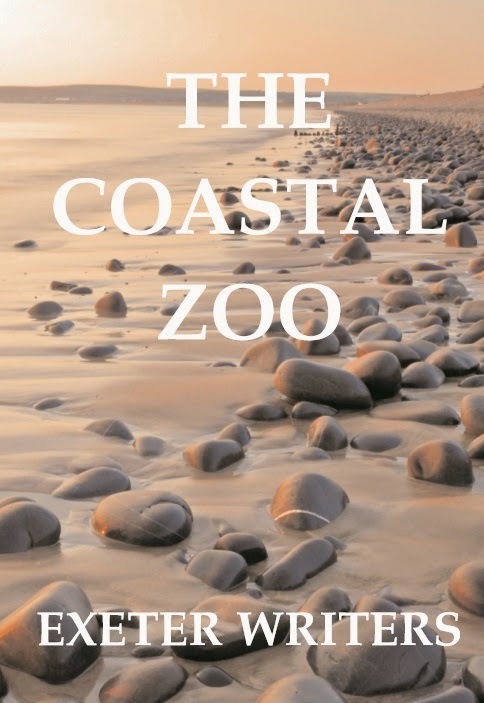 Exeter Writers: Well done, Cathie, on being a finalist in the Dorchester Literary Prize! Well done, Cathie, on being a finalist in the Dorchester Literary Prize! 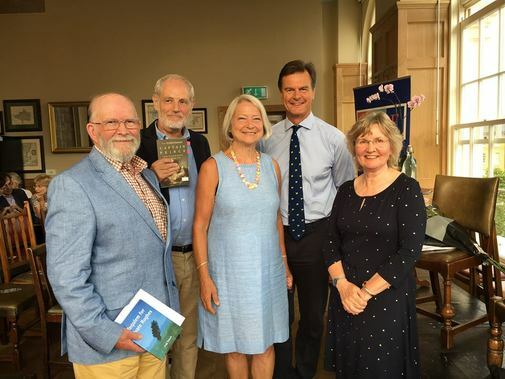 Chip Tolson, Philip Browne, Kate Adie, Anthony Woodhouse, me! Has there ever been such a week for losses? 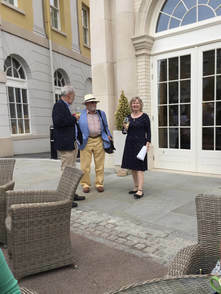 England, Federer, Nadal...and I didn't win the Dorchester Literary Prize. Not quite the same league, I know, and thank goodness I hadn't had to write Secret of the Song in front of huge crowds. Of course, I was disappointed, but I certainly wasn't devastated. It was a big thrill to get to the last three and be invited to the award ceremony in Dorchester. 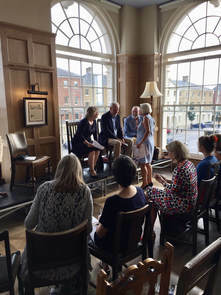 The prize was sponsored by Hall and Woodhouse who are the brewers of Badger Beer and own a chain of hotels including the rather marvellous Duchess of Cornwall in Poundbury, the venue for the ceremony. Philip Browne (winner), Chip Tolson, moi! 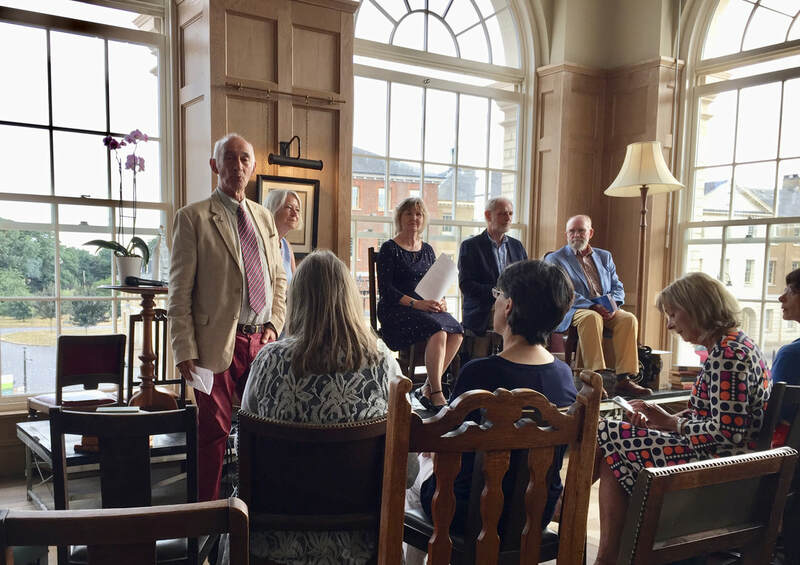 After a champagne reception and speeches by Paul Atterbury (of Antiques Roadshow fame), and the sponsor, Anthony Woodhouse, we were interviewed by Kate Adie. How cool is that? I don't think I stuttered, and she didn't ask me anything difficult. Yes, I did enjoy writing it. That sort of thing - to be honest, I can't remember what she asked me now. I do remember reading the opening of the novel, to the accompaniment of a car alarm going off outside which wasn't ideal. All the windows were open because it was so warm, but what splendid windows they are, as you can see. The announcement came after one of those strange periods of time that seem to go by quickly, and yet last for ages. It was Philip's name written on the slip in the envelope, and I am delighted for him. He was so thoroughly shocked to have won, and nearly fell off the staging. 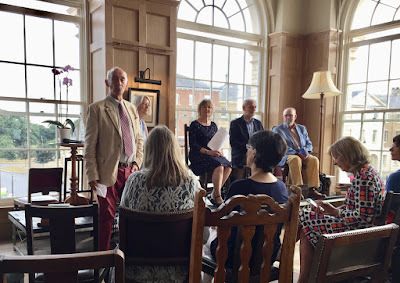 Afterwards it was photos, lots of lovely networking and chat with fellow writers, especially Chip Tolson, Liz Shakespeare, Kathy Shuker, Laura James and Gail Aldwin, and also some of the competition readers, who said such nice things about Secret of the Song, I was very touched. In fact, that has been one of the wonderful things for me - how many people wished me luck and wanted me to win. I wish I had won almost more for them than me!